It might not mean a thing, but then again it might! 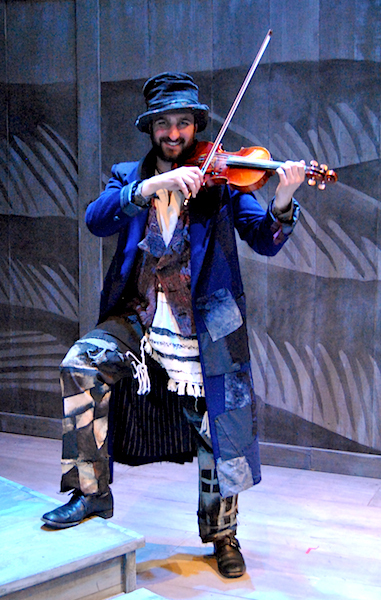 The Fiddler has inspired a great deal of research and reflection for longtime Violinist.com member Jason Hurwitz, who is currently playing that role in the Children's Theater of Madison's production of Fiddler on the Roof. He shared with me some of his thoughts about the 1964 musical, which he feels is as relevant today as it was back then. Laurie: How did you ever end up with a fiddle on your shoulder in the first place? Jason: I started learning the violin when I was five. I actually wanted to start after seeing Itzhak Perlman perform on Sesame Street when I was three, but my parents weren't sure I meant it at the time. Luckily, they were proactive and got me on the waiting list for the local Suzuki teacher (Patricia Thayer), because I was still asking to learn when I turned five. I spent the first eight years of my violin life studying with Mrs. Thayer, then studied with Dr. Kenneth Sarch for almost two years before joining Dr. Jennifer Sacher Wiley's studio for my high school years. In college, I studied with Glenn Basham at the University of Miami. I also owe a huge debt of gratitude to my public school orchestra directors, Mr. Jim Bertrand and Mr. Walt Straiton, for the invaluable educations they provided me throughout my formative years. Laurie: For a while you played in Barrage -- how long ago was that, and how long did you tour with them? Jason: I toured with Barrage from 2006 until 2010. In those four years, we performed in approximately 15 countries and nearly all 50 states, with multiple tours in Denmark, The Netherlands, Central America, and China. We also recorded two new CDs (High Strung and Winter's Tale) and put out a 10th anniversary greatest hits CD called Scrapbook while I was with the show. Prior to joining the group, I'll admit, I had been a superfan of the group, so landing a spot in the show was an absolute dream come true. Those four years were some of the best of my life; after all, there are very few jobs where you can get paid to tour the world while performing fun music with incredible musicians on an instrument you love to play. After I left Barrage, I spent the summer of 2010 working as the onstage violinist in Cirque Productions' show Cirque Dreams Jungle Fantasy in Atlantic City, N.J. It was a totally different experience from my previous performing experiences: in Barrage, I shared the stage with other violinists while doing choreography, so I mostly just worried about hitting my notes instead of other people; in Cirque, I shared the stage with world-class circus performers who were doing superhuman, often-death-defying tricks around and above me, so I mostly worried about staying alive. Laurie: You have spent the last years in arts administration; what made you decide to do that? How have you kept your playing up, during that time? Jason: After my time in Barrage and Cirque, I needed to figure out what to do for money moving forward. While in Barrage, I had been elected by the cast to be the Performers' Representative, which meant that I was responsible for all contract negotiations and communications between the cast, management, and the American Federation of Musicians. Doing that work really brought out my inner businessman -- I was surprised to find that I enjoyed it -- and so I started trying to find ways to combine my love for the performing arts with my love for business and contracts. I knew I didn't want to be an agent, but working on the presenter side of the live arts world really appealed to me. I applied, and was accepted to, the University of Cincinnati's Arts Administration program, and spent two years in Cincinnati earning both an MBA and an MA in Arts Administration. Upon graduation, I landed a job at the gorgeous Overture Center for the Arts in Madison, Wis., where I assist in scheduling and booking artists and shows for our two main stages, negotiate and execute the contracts for all of the shows we present, handle all artist hospitality, lodging, and transportation, and develop and run community engagement programs. To be honest, I haven't kept up with my violin as much as I would've liked to, but I do still play from time to time. I was in a different production of Fiddler last spring, and also played in the pit for another local company's production of Nevermore last summer. Now that I've been living in Madison for almost two years, though, I'm really settling in, and so I expect that music-making opportunities will present themselves more and more often. Laurie: How did the opportunity to do Fiddler on the Roof come up? Why did appeal to you? Jason: My wife was cast in a production of Fiddler on the Roof last year. When she found out, at the first rehearsal, that the company was still looking for someone to play The Fiddler, she came home and asked if I'd be interested in playing in the show. It was a small community theater production and the role was unpaid, but I had always wanted to play the part, so I agreed and ended up having a great time. About a month after that production closed, I got an email from the Artistic Director of Children's Theater of Madison saying that she had heard great things about my performance in the community theater production of Fiddler and asking if I would be interested in reprising the role in her company's professionally-produced production of the same show. Now, nearly a year later, the show is open! Laurie: What is it like to be the "Fiddler"? How much is this crossing over into real life for you? Jason: Playing the role of The Fiddler is a fun challenge, but one that I jokingly say I was always destined to play because I'm a Jewish, male violinist. One of the biggest challenges of playing The Fiddler is that I'm a member of both the orchestra and the cast, so I spend a lot of time moving between the stage and the "pit" (in this case, one of the houses in the village) -- I have very little "down" time during the show. Of course, when I'm on stage, that's when I'm having the most fun -- I get to dance, play, and interact with the other cast members, and that's the part of performing that I absolutely love! Believe it or not, this role has impacted my life off-stage. First and foremost, I've had to grow a beard for this role, so I stopped shaving on March 1. The show runs through Mother's Day, so it'll be a nearly 3-month beard before it's gone. I've gotten mixed results from friends and coworkers -- some like it, some don't -- but, of course, my wife hates the beard (she doesn't mind how it looks, but can't stand how it feels) so I'm pretty sure she's counting down the days until I start shaving again. Also, this role requires, obviously, that I spend at least part of the show on a roof high above the stage. Since I'm afraid of heights, I've really had to work on playing my violin and looking comfortable while perching near the edge of the roof (in this production, they've turned a part of the balcony into my roof, so it's not terrible, but it's still high), so that's been a good exercise in mind over, well, mind. Laurie: Fiddler on the Roof certainly is about a bygone era, maybe even in some ways a bygone culture. Do you see any lessons that the story has for us, today? Or to re-frame the question: How does the story-world of this musical mix with the story of modern life for you, what thoughts does it conjure? Jason: This is a seemingly straightforward question with an intricate answer. 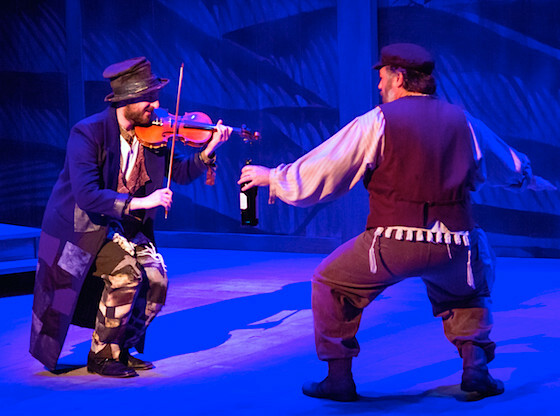 Yes, Fiddler has some great lessons for us today even though Tevye, the show's main character, first appeared in print in 1894. Once you've stripped away all of the Broadway-style comedy, all of the side stories, and all of the caricatured characters, the heart of the story is left: Tevye's attempts to deal with the change happening all around him. In the show, the world is modernizing (Motel Kamzoil, the tailor, buys a sewing machine), cultural norms are changing (Tzietel and Motel arrange their own marriage without the help of Yente, the matchmaker, and Perchik has radical, revolutionary ideas), and Jews are dealing with anti-Semitism (the whole village is forced to leave their homes after having already suffered through a pogrom). Nowadays, the world is still modernizing (faster than ever), cultural norms continue to shift (gay marriage as a topic of debate, for example), and negative "-isms" (anti-Semitism, racism, etc.) continue to plague people all around the world, so the core message of this show rings true for almost everyone who goes to see it. I think it's important to mention that, recently, outright anti-Semitism in the Ukraine proved that the discrimination faced by Jews in the early 1900s in Russia has not disappeared in the 100+ years since then: Jews in the town of Donetsk were told that they need to register with the local government, pay a fee, and declare all property holdings. Apparently, the lessons taught by Solem Aleichem's stories, Fiddler, and history still need to be learned by a lot of people. I'm currently reading Wonder of Wonders: A Cultural History of Fiddler on the Roof by Alisa Solomon. In it, she explores how Fiddler, based on the stories of Sholem Aleichem, has shaped modern people's "image of the shtetl as a metonym for all of East European Jewish culture" (page 50), effectively causing caricatures and romanticized memories to become realities. The nagging mother, the bumbling father, the soft-spoken rabbi, and even the somewhat quirky musician are all stereotypes that Fiddler helped create and solidify as part of popular culture. I've actually been so interested in what I'm reading that I've started a series of hashtags to celebrate Fiddler throughout my run in the show: #MotelMondays, #TzietelTuesdays, #WhateverWednesdays (hey, don't judge), #TevyeThursdays, and #FiddlerFridays. You can find my posts, which look into various topics associated with Fiddler, on my blog. Laurie: I've looked at your blog, and I noticed that you posted a lot of Fiddler on the Roof logos a few weeks ago! How many different Fiddler graphics did you dig up, and what made you go after those? Jason: Ha, good question! In less than 10 minutes of looking online, I found almost 50 Fiddler logos from past productions. As part of my previously-mentioned #FiddlerFact series, I needed to come up with a topic for #FiddlerFriday: the idea just hit me to look up variations on the Fiddler logo. I used a similar thought process when I decided to look into what Motel's sewing machine might have looked like – the results of that search made it into my #MotelMonday post.